Boldizzoni’s point of departure is the Polanyian proposition that refers to “the economy as embedded in a meaningful system of social relations. This involves a common conception of rationality, institutions and human culture” (Boldizzoni 2013: 10). The author suggests there is a strong relationship between the pace of economic affairs and the growth of economic history, as exemplified in the disciplinary boom experienced during the turmoil of the interwar years (1918-1939) and the golden age of Fordist capitalism in the post-WWII era. While recognizing this linkage, Boldizzoni cautions nevertheless “to not let the present drive our search for the answers, because this would mean that we no longer respect the otherness of the past.” (Boldizzoni 2013: 2). On the one hand, Boldizzoni doubts about the virtues of studying history for deriving policy lessons. He does not embrace the literature comparing the Great Depression and the Great Recession, as “analogies stop at a very general level, precisely when we abstract from the plane of individual historical situations to consider the economic and social system of which they are a part. This is where the study of the past meets social theory” (Boldizzoni 2013: 2). Nonethelesss, as Eichengreen has argued, analogical reasoning might have prevailed among “journalists, market participants, and policymakers” after Lehman Brothers collapsed in September 2008 because: “there [was] limited time to reach a decision and those reaching it [had] limited information-processing capacity […and individuals] disagree[d] on the principles needed for deductive reasoning.” (Eichengreen 2012: 289, 293). The intensity in the use of the analogy might be explained as “crises are when the pressure to act is greatest but also when there is least time for theorizing and data gathering” (Eichengreen 2012: 293). The “Great Depression” concept was used in comparisons with the contemporary economic turmoil both “as metaphor and analogy. As metaphor, it helped to mobilize public support for extraordinary action of some, unspecified type. As an historical analogy, it pointed to specific steps and away from others” (Eichengreen, 2012: 302). 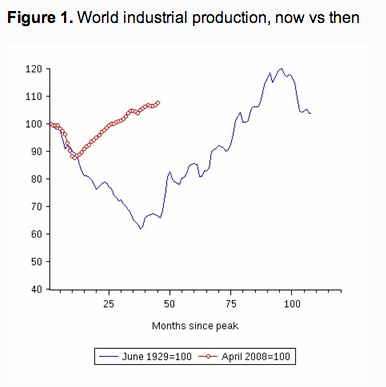 The Great Depression and the Great Recession: World Industrial Production. Source: Eichengreen and O’Rourke (2013). 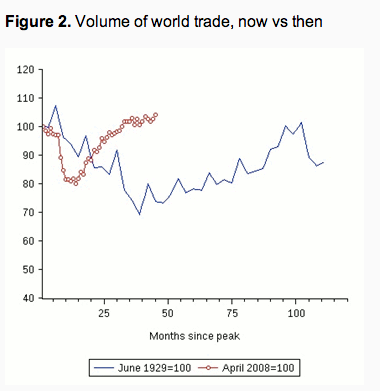 The Great Depression and the Great Recession: Volume of World Trade. Source: Eichengreen and O’Rourke (2013). 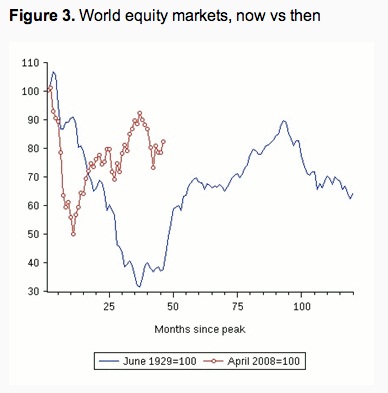 The Great Depression and the Great Recession: World Equity Markets. Source: Eichengreen and O’Rourke (2013). On the other hand, Boldizzoni is not eager either to follow antiquarianism and study history for its own sake. There is always a reason why men and women question what has happened and why; as the past has a legacy in the present: “we clearly continue to deal with the past because we feel that, no matter how distant and different it is, it is not alien to us.” (Boldizzoni 2013: 2). Hence, economic historians need to be very aware of the alterity of their object of study, inasmuch as they recognize the strong pull of their present concerns as scholars and as members of epistemic communities, for all kinds of historical craft preserve collective memory. Boldizzoni is on the side of those who like Marc Bloch see history as a social science that deals with “the evolution of societies across time” (Boldizzoni 2013: 3). Nonetheless, he is concerned by the prevalence of economic history accounts where time and change are not preeminent. Collective memory is a function of the pace of external change affecting a society: whether memory will adopt the form of timeless myth or historical study will depend on whether the society has a historical sense of time. Ancient Greece and Rome as well as other non-European civilizations in the Near East, South and Central Asia did not have historical sense because they did not attest dramatic changes in the history of their socioeconomic structure, hence, they relied on myths to preserve their shared memory. Economic history grew out of change in Europe: the rise of the commercial society and the English industrial revolution were defining processes preceding the birth of both political economy and economic history. Scholars in developing countries and regions of the world, such as China, India and Latin America, are eager to make sense of the material past of their societies as they become structurally transformed by the dynamics of global capitalism. However, postmodern societies are “keen to forget [their economic past],” submerged as they are in the age of dislocation (Boldizzoni 2013: 3). Boldizzoni argues that classical political economists such as Smith, Ricardo, Malthus and Marx attempted to make sense of the “great transformations that were shaping the first modern economy.” (Boldizzoni 2013: 4). Smith, Malthus and Marx also tried to explain the processes behind these material changes: they formulated historical hypotheses, and wrote in an argumentative mode that relied on historical examples (see Foucault 1968: preface, 165-198, Cipolla 1991: 74-76). The Enlightenment, however, also planted the seeds of the ahistoricity of economics: whilst thinkers began to study a natural order with universal and eternal laws, they were tempted to extrapolate deductive inquiry into social life, for in their minds society had to follow nature, without consideration of time and space. Henceforth, by the first half of the nineteenth century there was already a conflict between those who abstracted the temporal and historical specificities from social reality (as David Ricardo), and those who advocated for a more historicized approach to society (as Friedrich List, who famously called the former “cosmopolitical” economists, in opposition to true political economists). Two theories of “natural social order” created a void for the birth of economics as a discipline distanced from history. Seventeenth-century English philosopher Thomas Hobbes provided the strong form of these theories. Hobbes was the first political thinker who claimed that humans entered into a social contract to protect their natural rights to life and property by means of the state: the Hobbesian proposition can be summarized as economic order preceding political order. Adam Smith’s eighteenth-century moral philosophy embodied the soft version of the natural social order theories, as he was the first to explain human behavior in reductive, materialist terms, and emphasized the importance of free trade as ideal means for social prosperity. Afterwards, Boldizzoni offers a synthetical view of the development of economics as a science from its incarnation as “social physics” in the late nineteenth century to its contemporary form as a highly mathematical and abstract discipline which understands her object of study as nothing more but a “mechanical clock” (Boldizzoni 2013: 5). In his opinion, the history of economics demonstrates that not only economic crises and recessions lead to shifts in paradigms, as was the case with the Great Depression and Keynesianism; but also that political conjunctures are often seized by scholars with different ideologies to alter the terms of the debate. This is exemplified as the oil shocks and rapid inflation of the 1970s coincided with the rational expectations revolution and the emergence of the rational choice paradigm, followed by the election of conservative governments in the United States, the United Kingdom and West Germany, during “an era of disaggregation, a great age of fracture” (Rodgers 2011: 3). Boldizzoni differentiates classical liberalism and neoliberalism by the scope of their objectives. Whereas classical liberalism stood in favor of free trade and unfettered markets, neoliberalism attempts to impose “competition as the basic rule of social interaction” (Boldizzoni 2013: 5). In Boldizzoni’s view, neoliberalism stands behind economic imperialism over other social sciences and explains the emergence of fields such as law and economics (which inquires into the efficiency consequences of laws), political economics (which evaluates political institutions as vehicles for public choice and rules of the game leading -or not- to economic growth), and the new institutional economics (which has evolved, in his opinion, into a full theory of the state). “Sociology, political science, law and history are constrained by the straitjacket of the new institutional economics and used to confirm the pre-packaged theorems of global competition and growth.” (Boldizzoni 2013: 6). Pro-market think-thanks and think-nets in the United States and Europe advance the cause of Anglo-American neoliberalism and European ordoliberalism by intervening actively in the discussion of public affairs, with heavy financial backing from conservative business donors. These neoliberal organizations and webs all share “the tenet that economic order creates political order, and a passion for social engineering.” (Boldizzoni 2013: 6). Boldizzoni then explores the issue of why is the market presented as the only possible and optimal allocation mechanism in social life. Paladins of neoliberalism depicting the market as an instrument of freedom often resort in their arguments to the perfectly competitive market, a heuristic device as well as a myth, “a representation arising out of a misunderstanding of natural laws leading to baseless ‘policies'” (Boldizzoni 2013: 8). The problem, however, is that some of these myths “are taught at university, and enter textbooks, [and are] viewed as models for policy-making and embraced by governments and international organizations”, with unintended, dislocating results in polities and societies (Boldizzoni 2013: 8). The identification of markets with freedom is a question susceptible of historical inquiry, as is the uncritical exaltation of the virtues of the free market. Nonetheless, history is a contestable market, and some economists with vested interests often misuse economic history to offer “interpretations of the past [which are then] reduced to instruments of persuasion. The resulting narratives can be categorized as pseudohistories […] Whereas history is complex, pseudohistories typically make strong claims and propose one-size-fits-all interpretive keys” (Boldizzoni 2013: 9). Economic historians, then, should strive to criticize poor scholarship, even that produced by widely admired authors, and reveal the origins of all that we take as granted, “to dispel the myths of pseudoscience. This makes [historians] responsible to society.” (Boldizzoni 2001: 8). Thence, it is also a task of the economic historian to disentangle fact from myth, and science from ideology. Boldizzoni provides an example of social engineering in the light of the euro crisis, as unaccountable, non-elected technocrats have assumed political power in Greece and Italy. The author is interested in how these technocrats tied to both the supranational European Union and investment banks such as Goldman Sachs justified to the public the necessity of painful structural reforms “as if it was the economy, not politics, that demanded them. The reforms were neither good nor bad – they were necessary. This rhetoric of objectification, whereby the economy [was] attributed an independent and neutral existence, was promptly embraced by the leading media” and the political establishment of both countries (Boldizzoni 2013: 7). After reading Boldizzoni’s paper, I can think of three promising venues of research, one comparative, the other trans-disciplinary, the last one synthetical. – From a comparative perspective, it would be very useful to understand the parallels and contrasts between the pro-market reforms imposed by the current rule of experts in Southern European countries vis-à-vis Latin America in the 1980s or Russia and the former socialist countries in the 1990s. An obvious difference is the degree of social conflict generated by the imposition of economic reforms from the top to the bottom. Tracing the socioeconomic networks of economic technocrats and policymakers might provide clues to why certain sets of policies are preferred over other possibilities and courses of action. There is also room to question how malleable the neoliberal mindset is, as it accommodates policies that are undesirable for her ethos, except under critical conditions (e. g., governments bailing out banks, central banks buying securities, among others). – A trans-disciplinary approach necessitates the conceptual framework of the performativity of economics, which explores how “the academic discipline of economics does not always stand outside the economy, analyzing it as an external thing; sometimes it is an intrinsic part of economic processes” (MacKenzie 2008: 16), in addition to the sociology of the economics profession, as well as anthropological and ethnographic approaches to economists as academics, consultants, policymakers and (unexpected) politicians. Then, we would also have to understand the performativity of economic history and the sociological, anthropological and ethnographic particularities of economic historians. In conclusion, Boldizzoni’s claim that “one cannot write economic history that is not at the same time social and cultural history” comes exactly at the right moment, as his critical appraisal of the state of the field has found fertile ground amidst social scientists trying to make sense of their toolkit to study the world in the age of disenchantment (Boldizzoni 2011a: 136). In a few years, The Poverty of Clio might become a classical reading on the state of economic history in the first years of the twenty-first century, but it is not a sufficient element for questioning epistemological assumptions and methodological practices within the discipline. Such a reflection is necessary if economic history is to stop drifting away from history and become either historical economics or retrospective econometrics. Let us not forget the wise words of Charlie Kindleberger, who might have forgotten where he wrote them, but would surely stand by his opinion, which is stronger and more alive than ever: “economics needs history, even more than history needs economics” (Kindleberger 1996: xiii). 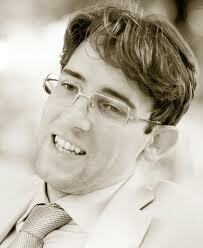 Boldizzoni, Francesco (2013), ‘On History and Policy: Time in the Age of Neoliberalism’, MPifG Discussion Paper 13 (6). — (2011a), The Poverty of Clio. Resurrecting Economic History (Princeton, NJ: Princeton University Press). — (2011b), ‘The Poverty of Clio. How Economists are Abusing the Past’, The Montreal Review, accessed 15 November 2013, http://www.themontrealreview.com/2009/The-poverty-of-Clio-Boldizzoni.php. Cipolla, Carlo M. (1991), Between Two Cultures. An Introduction to Economic History (New York, NY: Norton). Eichengreen, Barry (2012), ‘Economic History and Economic Policy’, Journal of Economic History, 72 (2), 289-307. Eichengreen, Barry and O’Rourke, Kevin H. (2012), ‘A tale of two depressions redux’, in Richard Baldwin (ed. ), VoxEU (2013; London: Centre for Economic Policy Research), accessed 15 November 2013, http://www.voxeu.org/article/tale-two-depressions-redux. Foucault, Michel (1968, originally published in 1966), Las palabras y las cosas. Una arqueología de las ciencias humanas (México: Siglo XXI Editores). MacKenzie, Donald (2008), An Engine, Not a Camera. How Financial Models Shape Markets., eds Wiebe E. Bijker, W. Bernard Carlson, and Trevor Pinch (Inside Technology; Cambridge, MA: The MIT Press). Kindleberger, Charles Poor (1996), Manias, Panics and Crises. A History of Financial Crises (New York, NY: John Wiley & Sons, Inc.). Rodgers, Daniel T. (2011), Age of Fracture (Cambridge, MA: The Belknap Press of Harvard University Press). Sewell Jr., William H. (2012), ‘What’s Wrong with Economic History?’, History and Theory, 51 (3), 466-76. — (2010), ‘A Strange Career: The Historical Study of Economic Life’, History and Theory, (49), 146-66. — (2005), Logics of History. Social Theory and Social Transformations, ed. Jean Comaroff, Andreas Glaeser, William H. Sewell Jr., and Lisa Wedeen (Chicago Studies in Practices of Meaning; Chicago, IL: The University of Chicago Press). My take on a stimulating paper by Francesco Boldizzoni.